Sounds good to me. Do we need to read this in order? I've only read the first book, but I think if you wanted to start with a later book in the series you'd still be fine. I've been eyeing this series ("Body Farm" definitely catches my attention), but I haven't tried it yet. Good to know the books are worth reading. I liked both the mystery and the characters! I haven't seen this series, sounds creepy. Dealing with the dead bodies and bones is a little unsettling, but it's not the kind of book that'd give you nightmares. This sounds like a fascinating mystery! It was different and fun. Adding this to my TBR immediately!! Thanks for putting this one on my radar!! Glad to be of bookish assistance. ;D Happy reading! Ooh glad this was good. That excerpt you provided definitely sounds interesting! This sounds good! Like maybe for reader who also enjoy Kathy Reichs' books? I would say yes. Definitely. An old feud huh? Sounds good to me! I really like the cover of the book-pretty yet creepy! 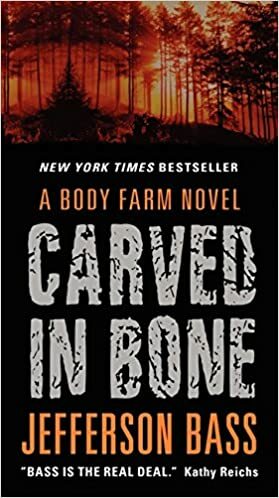 Carved in Bone sounds like an interesting mystery series that will involve solving cold cases which can be so fascinating with the killer finally being brought to justice. Dr. Brockton sounds like an interesting character as well. I really liked Dr. Brockton! Have you heard of the Dr Thorndyke books by R. Austin Freeman? I recently finished 'The Vanishing Man' and it was very enjoyable. It's an older book, early 1900's and the author had a medical background so his knowledge of forensic science is a major component in his books & his detective uses these means to solve cases. I have read one of this books before and thought it was quite entertaining. Thank you for reminding me about this series!